If you are going to hike here, get yourself ready! 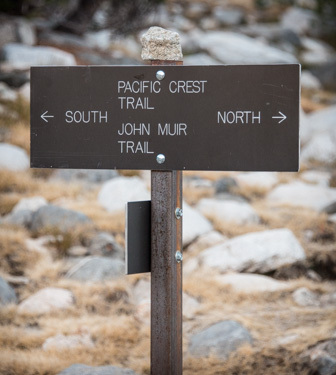 If you are going to prepare for a John Muir Trail thru-hike, or even a substantial section hike, you need to get out and do some walking. Here are eight tips for the perfect training hike. Note that I am talking about a day hikes, not a multi-day equipment shakedown hike, which is also a good idea. 1. Happens often. Just getting out on the trail on weekends isn’t enough. Try to find a place close by for at least one, if not two, long walks during the week. 2. Is on uneven terrain. I’m not going to say that road walking doesn’t count—it clearly does—but it doesn’t demand enough of the stabilizer muscles you are going to work so hard on an uneven trail. Get off the road or sidewalk and do some walking on uneven terrain. I’m lucky; here in Hawaii the trails are generally of much poorer quality than those you find between Happy Isles and Mount Whitney. I’m am very accustomed to roots, rocks, and poor footing. 3. Includes lots of climbing and descending. You will probably spend nearly two-thirds of your time ascending during your thru-hike. You better get used to it. And, as many people find out, the descents are not effortless, either. 4. Is done in the same footwear you will use on your hike. You don’t want to wear out your shoes or boots before you start, but neither do you want untested footwear on your first day. Depending on how rough the terrain is where you train, you can start hiking in the footwear you intend to use from months to weeks ahead of your trip. 5. Includes your backpack. Oh, and be sure to put some stuff IN THE BACKPACK. 6. Includes the clothes and some of the gear you intend to wear and carry. You definitely want to try out the same clothes in order to discover unexpected problems, either with fit or chafing, or with durability and suitability. Certain gear choice should be carried as well, such as your trekking poles and your camera, especially if you are intending to carry your camera in such a way as to make it available at all times. 7. Culminates with the right length of hike. There is nothing wrong with starting out small, but by the time you are within a few weeks of your hike you should be able to comfortably do back-to-back days at approximately the same distance as your typical day on the trail. 8. Is at high elevation. This one is hard to do if you are near sea level. Still, if you have the opportunity to train above 5,000 feet, it certainly helps. Keep at it, April, and good luck! Great plan, David. Thanks for the comment! Always love your tips and insight Ray. Jmt 2017! Thanks for the kind words, Mark, and good luck with your planning! That’s a great list. I want to underscore one I didn’t do before my failed attempt three years ago – and I think it might have made a difference. Doing some BACK-TO-BACK days in training is really important. Thanks Ray, Happy New Year! And a Happy New Year to you and George!